The excellent but coward painter Gilbert Stuart escapes from his homeland, the United States, to England in the year 1775, forced by the political atmosphere of the incipient American revolution of 1776. Once in London, despite already mastering the technique, continues studying next to Benjamin West who, surprised by the skill of his student, proposes him to portrait him. This canvas is submitted to an exhibition of the Royal Academy of Art and it is acclaimed by the critics. So far, Stuart’s portraits never were full body. He only painted the face and part of the bust. Maximum, “until the fifth button”, in his own words. After the mentioned exhibition, William Grant asks Stuart to paint him full body and, encouraged by the reception of the portrait of his teacher, our artist takes the challenge. 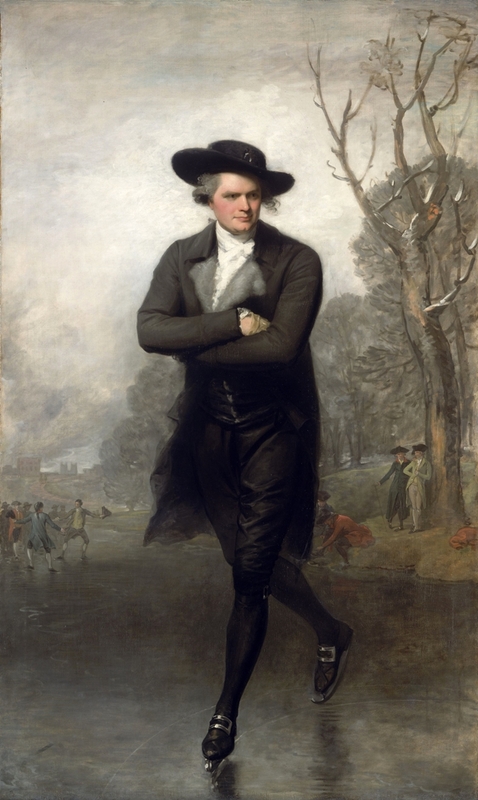 Grant gets to Stuart’ studio and, in reference to the weather, he says: “with this cold, it seems more appropriate to skate than to stand posing for a painting”. Both look each other and came with an idea: to go skating to Hyde Park. They do and Stuart decides to portrait Grant as a skater. The client consents and, once the artist gets back to his studio, starts to paint the portrait by heart, as he never did any sketches. In The skater, we see Grant elegantly dressed with his arms crossed. His posture and the attitude in his face shows us that he is a skilled skater, on the contrary of those characters we see in the background, who seem to do a lot of effort even to stay standing. Grant, instead, moves with grace through the ice. The composition is completed by a clouded sky, trees on the coast of the frozen lake and, far in the background, we can see Westminster Abby in an almost rural London. The originality of the canvas is well received by the Royal Academy of Art; and that way, turns Stuart into one of the most famous portrayers of his time, under the already recognized Thomas Gainsborough and Joshua Reynolds. ~ by Álvaro Mazzino on October 26, 2010. The flagship device is set to be launched next month, three months ahead of the next Apple iPad Air product line, the iPad Air 3 and iPad Mini 4, Master Herald reported on Sunday. This entry was posted on October 26, 2010 at 09:21 and is filed under Rococo.You can follow any responses to this entry through the RSS 2.0 feed.You can leave a response, or trackback from your own site.